BIG CYPRESS — James E. Billie’s musical career, dormant for nearly three years while he recovered from complications sustained in a horse training accident, came alive with fervor Nov. 8 when the Chairman of the Seminole Tribe of Florida and his longtime six-piece band took the stage at the American Indian Arts Celebration sponsored by the Tribe’s Ah-Tah-Thi-Ki Museum. 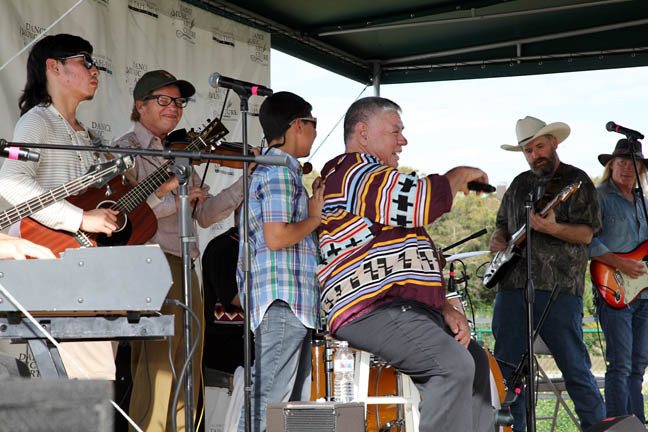 Under breezy blue skies, around 200 people waited to hear from the singing Chairman, a Grammy nominee who was named a Living Legend at the 1999 Native American Music Awards and was given the Outstanding Music Achievement award the same year by the First Americans in the Arts. The crowd included dozens of young Seminole children who have listened to Chairman Billie’s records but had never seen him perform live. During the 1980s and ’90s, especially, the Chief Jim Billie Band was in great demand at indigenous events, pow-wows and music festivals both inside and outside Indian Country. The band warmed up with “Girl From Immokalee” sung by guitar whiz Raiford Starke, before Chairman Billie took over with his familiar catalogue of stories and original songs – his trademark since he first began appearing on stage at the Florida Folk Festival in the early ’70s: “I wrote a song one time. I think it was about 1982 and I was flying my airplane over Lake Okeechobee and, man, Lake Okeechobee was dryin’ up. “That son of a gun was shrunk to about 100 yards from the center and I took my airplane down – I was about a mile and a half up – to see what was going on. I put the airplane in a stall, went way down to 50 feet and flew over thousands and thousands and thousands of alligators. Back when we were selling hides, I would have been a billionaire that day. I went back up to 10,000 feet and on to Tampa. As I was flyin’, words came into my head. From his signature song “Big Alligator” to his yearnings for his favorite Florida places in “High Tide at Chokoloskee” and “Sawgrass Flower,” and from his deep-voiced rendition of Joe Dan Osceola’s “Josie Billie: Seminole Medicine Man” to his poetic salute to nature’s predators and prey in “Ways of the Glades,” the Chief Jim Billie of yesteryear was back in great form. Each song carried a story, a history lesson, a Florida Seminole theme. As a surprise, Chairman Billie’s 19-year-old son Kowako appeared on stage with a guitar and rocked the joint with a boisterous rendition of “Seminole Man” and a sensitive version of his father’s tender ballad “Try and Try Again.” Another son, 13-year-old Eecho, jumped up on stage as well, singing along in his father’s microphone. Other than strumming a few tunes with the Chairman at his home during a recent filming, guitarist Starke admitted, “We really never rehearsed. I was a little wary of what might happen.” Starke put together the original band, including Hokkanen, Taylor, drummer Jeff Renza, guitarist/percussionist David Shelley and bassist Stevie Grandmaison.